Left to right: Eduard Mirage IIIC, Wingman Nesher, and Airfix Sea Vixen, all in 1/48. Anyone got any strong opinions? Go crazy! Start with the Vixen. I've always liked it, just never had the moxey to do one! FWIW, for the last two Hanger Queens,I've picked the one closest to being finished. Don't really want my Hanger Queens to repeat. I vote for the Sea Vixen too! I have wanted to do a Sea Vixen since the first IPMS Region IX contest that I went to. Wow,Gary, long time no see! Well, so far the Sea Vixen is winning the vote in a runaway. Sea Vixen. 'Cause it's funny lookin'. OK, that's a valid viewpoint. I prefer to think of it as elegant in an unusual configuration. I'll concede it has a certain allure...but no more. Just have fun with those kits ! I'm looking to join the campaign, if you'll allow me...mine isn't a hangar queen in the traditional sense. 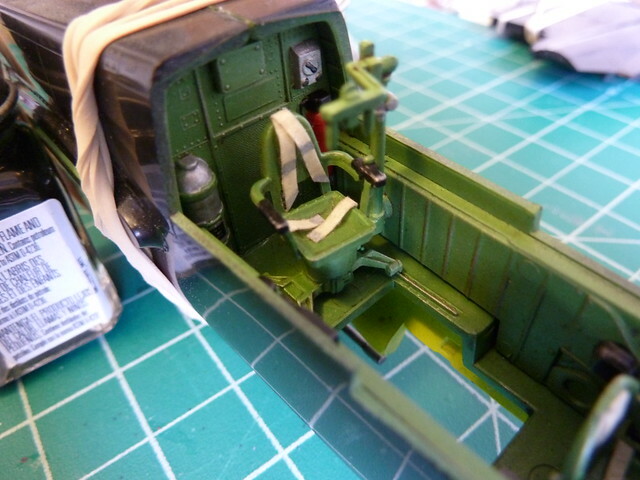 My entry would be Monogram's P-61 in 1/48, either the second or third kit I built by myself. It ended up pretty FUBAR and got thrown away before I finished it. I still have a number of parts from it in my spares box, plus the unused decals. So my "hangar queen" is really more of a "redemption song," as I bought another kit to try to make now what I screwed up about 15 years ago. 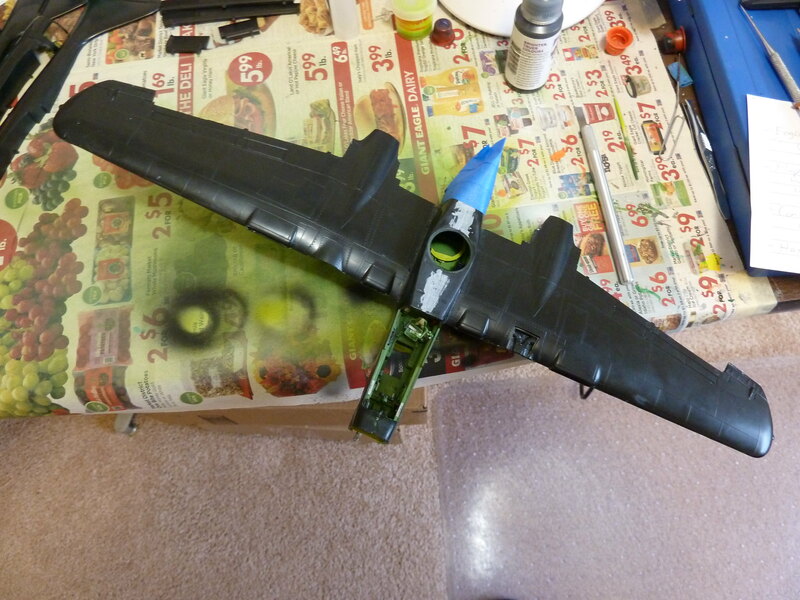 Again, I realize this isn't what most people think of with hangar queens...but I DID in fact start building the P-61, never finished it, and want to have a P-61 on my shelf now! Feel free to debate this...I will accept any outcome. Robby, as you know I've given some considerable thought to your request. The Hangar Queen campaign by its nature has lots of grey areas. Personally, I think that in this hobby the goal is bring the build to a completion. I recall the sage words of a good buddy "Tis easier to buy, than to build. ", that said, if you've got the parts and decals and you're motivated to bring it all together, I'm for it. Granted, this takes the campaign guideline to it's loosest interpretation, but if nobody chimes in within the next 2 days, go for it! Till then enjoy this wonderful hobby! Hey I say go for it! That's likely to be the oldest "Hangar queen" we'll get! And you can't beat it for the nostalgia as well. I get a real kick out of the then and now facet of building skills. Oh and Michael? Dude it has to be the Sea Vixen .... can't go past a moniker like that! I was hoping for more of a dialogue with this...I think it's a unique rule challenge and thought I could get more opinions out of the community. I'm still glad to entertain further discussion if anyone has opinions. In the meantime, John and Chris, thank you for your blessings I still have a few builds I'm finishing up right now, but I think I can get my Black Widow 2.0 up and running by the end of the year! Robby, FWIW, Hanger Queen is about finishing projects. I think I started last year with 30 queens. Some close to finished and at least one with nothing done but paint in the wheel wells... I managed to get 2 done, and ended the year with 29 queens. 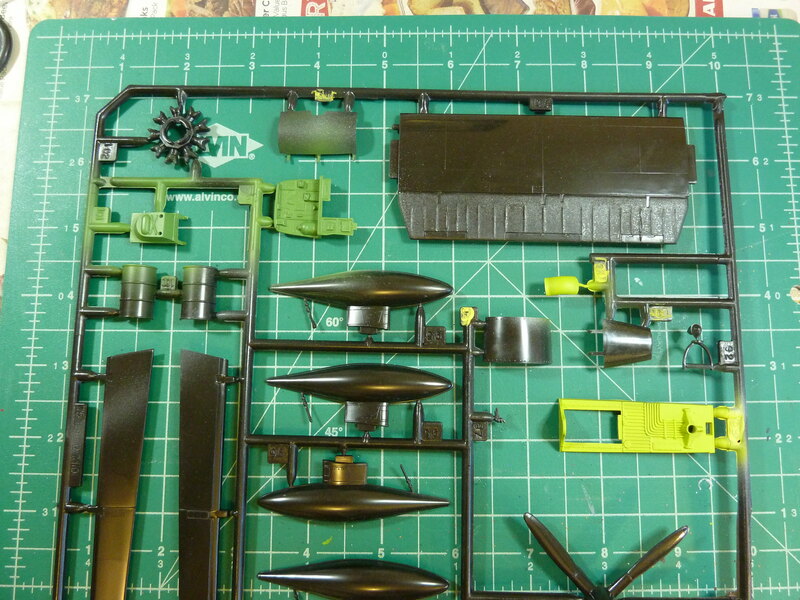 My number one target this year is an F8F Bearcat that is just shy of paint and decals. I just need to replace the 20mm cannons with some AM and it's ready to paint and decal. So while you are starting from a fresh kit, you are trying to complete a project, so I'm fine with it. In my opinion, it would not count, otherwise anything would count. It should have been started already to be in the spirit of this campaign. Age if the kit itself plays no part in it. 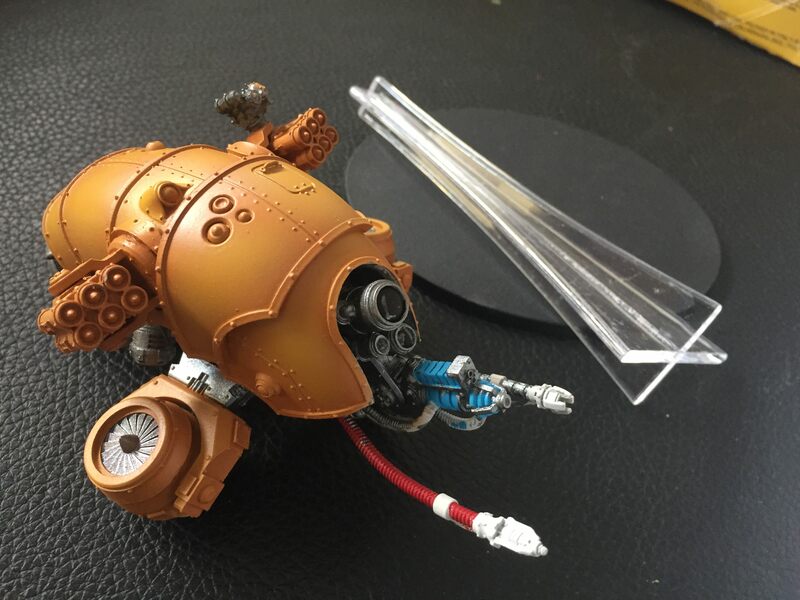 I am going to get this Vulturax drone done. It has been in the painting lineup for almost a year now. Planning on getting both the base and drone done. I have one question. After the starting photo is posted can I pull it apart to get at the cockpit and engines to improve them? If not that is fine. My entry will be a Northrop T38 Talon. It was started for the Very Civil campaign. This specific aircraft was owned by the Boeing Company. I would think it's OK. There's no rule that you can't put more detail in places already assembled. Absolutely! Your starting picture is just that, where you're starting from. How you finish it is up to you. 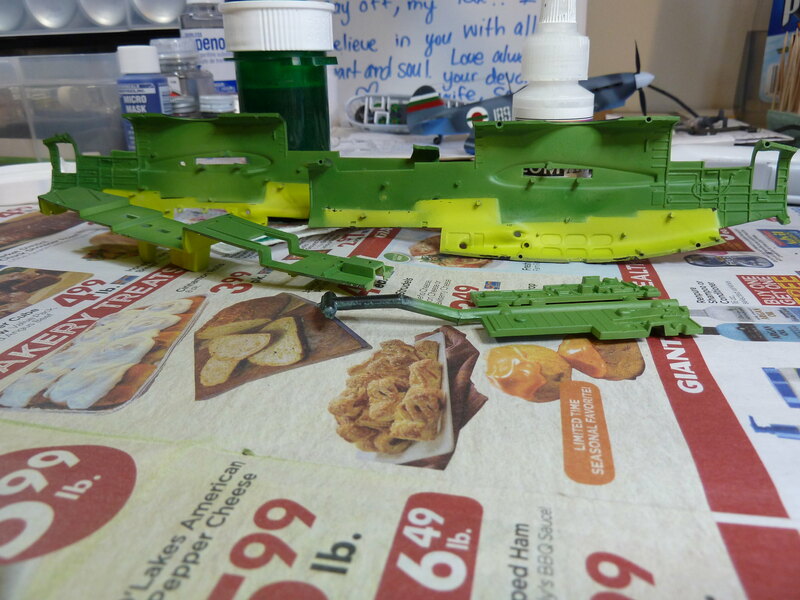 Just load up some progress pictures, I know I'd love to see what your doing to the T-38! I've got a P-47 in the bullpen, the plane was ruined when the final clear "shattered" (never seen it before or since), so my first thing will be to post the pic and ask the community if they've ever seen such a thing (no replies from the 56th P-47 group build) then it's getting stripped, and done as something different. Jesper, that is a cool looking drone. I'll be watching with interest! A quick update on my Queen of Misery. I tinted the glass, a first! Got the 3 parts for the fin/rudder together, and wouldn't you know it! Lousy fit, so more sand fill and repeat for me. Pictures and commentary to follow. Again, thanks to those who gave me the go-ahead on my entry Here's what I'm working with now, just the zinc chromate parts are painted. 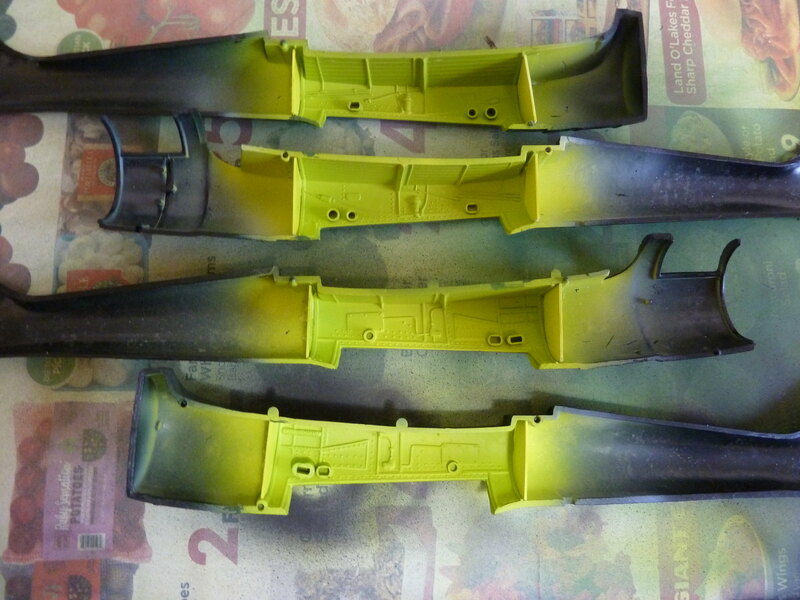 Green for crew areas, yellow for other interior spaces. Looking over the kit quickly shows moderate and generalized surface detail, a good amount of pin marks, and SO MUCH FLASH on these sprues. 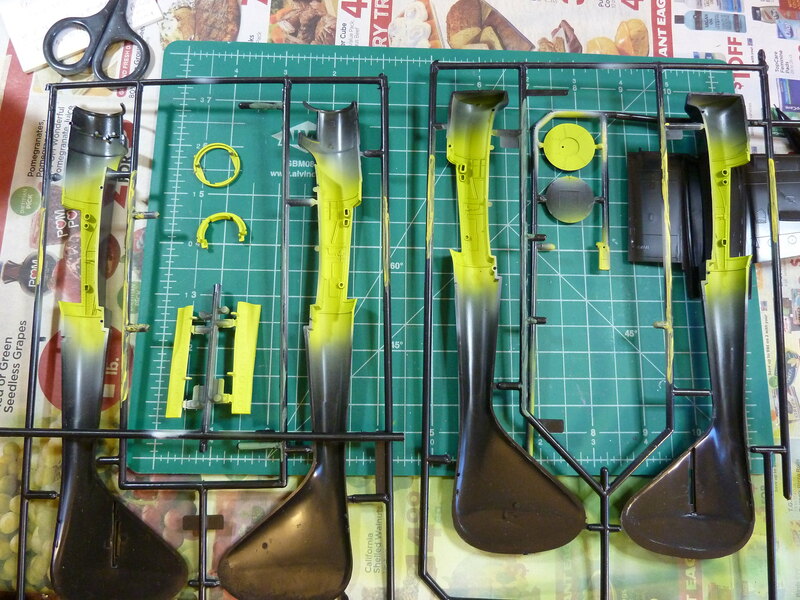 The age of these molds is truly showing, especially compared to all the Tamigawa kits out now. But I knew what I was getting myself into...hopefully I can put together a decent looking bird from these chunky sprues. wrassled the gallery dragon into submission..
Two pics of the Cobra uploaded. 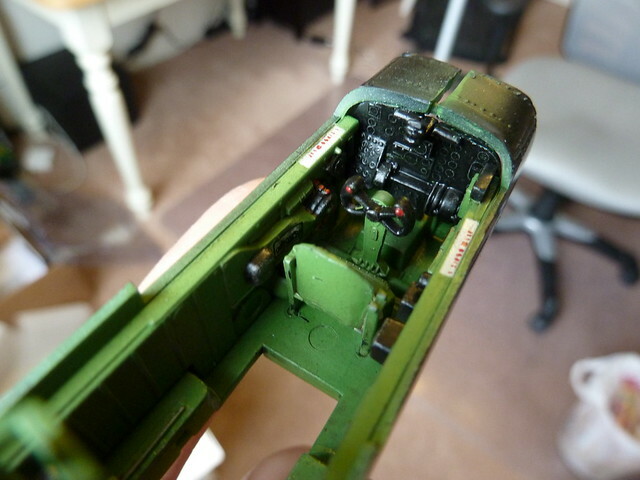 I'm making slow progress with the P-61. Honestly it's just hard to get motivated on this kit. 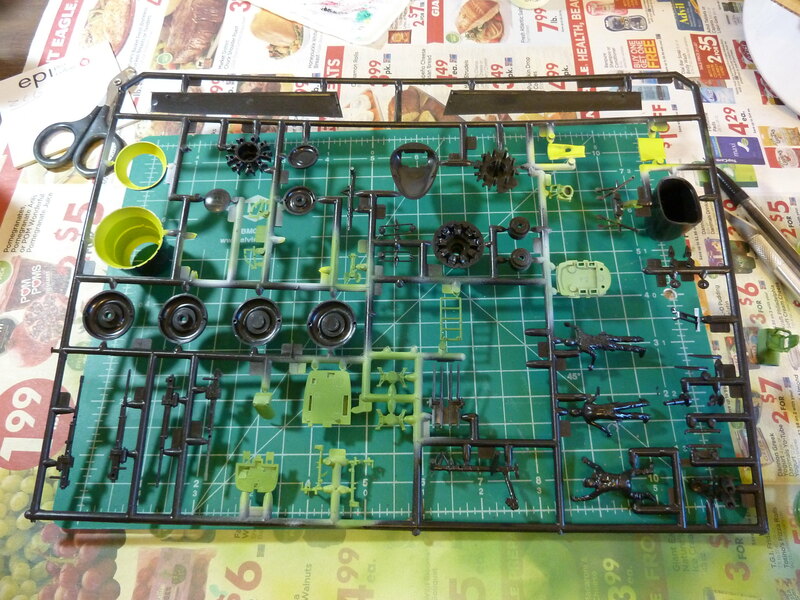 The amount of work to put into this kit in order to get a result that I'd describe as "distant and out of focus" or "generally accepted as a Black Widow"...it's a lot for me right now. 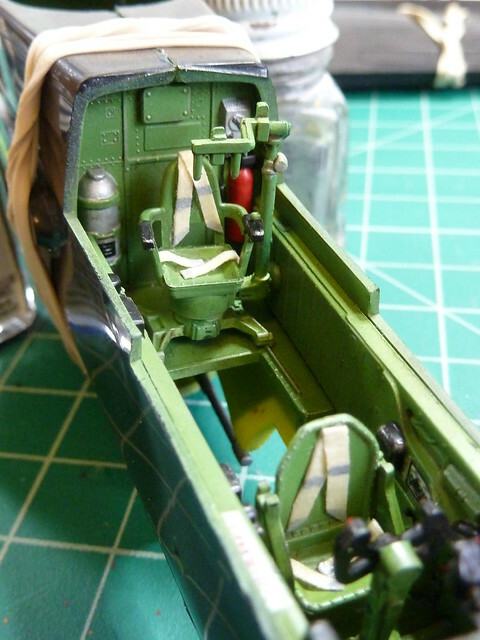 But I got probably the most tedious section complete, the crew compartments! The bulk of my time was spent removing mold seams and pin marks, and even still I missed a few throughout. In places, the ejector pin marks were so pronounced that they looked like intentional detailing. I did my best on the cleanup, assembly was easy enough, and detail painting was done by hand with enamels. I did an oil wash over the walls and floors (I'm very new to oil washing, but I think it worked well) and drybrushed aluminum throughout, particularly on the chair runners. Harnesses are my usual masking tape with aluminum buckles painted on. 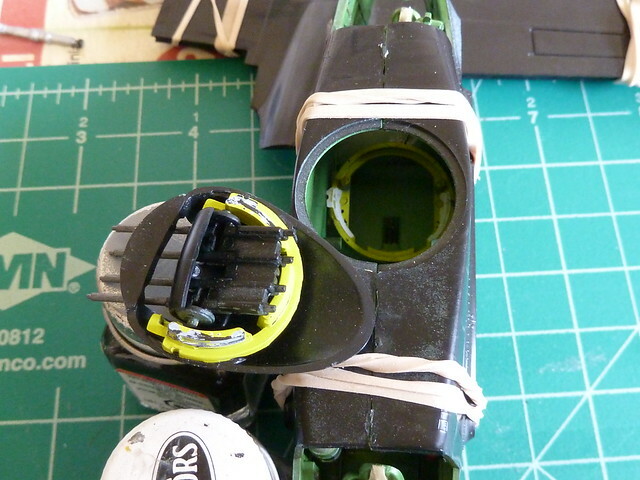 While gluing the fuselage halves together, the dorsal turret is supposed be sandwiched into place and remain movable. A combo of inadequate glue and excessive mandatory manipulation resulted in the "sandwich" falling apart. 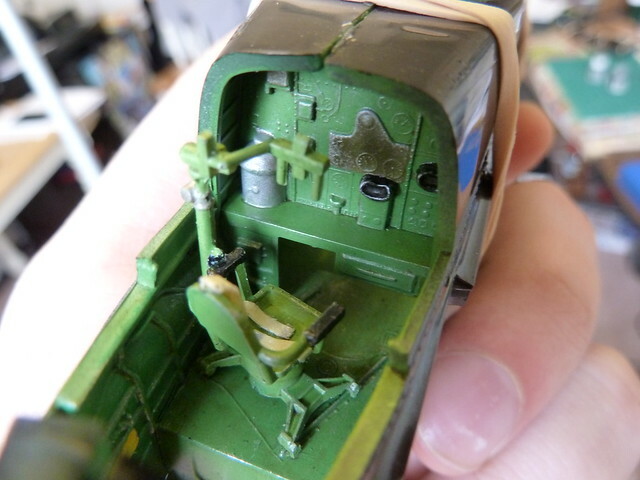 Now I need to find a way to glue the turret back onto the stabilizing ring, which is stuck inside the fuselage. I have a feeling it's going to require a maneuver like Michelangelo and the Sistine Chapel. I know how you feel! I am working on Tamiya's 1/20 Brabham BT46 for the Garage Queens 2018 campaign and finding the same things on this kit. A bit more progress. The plane is finally starting to look like a plane! 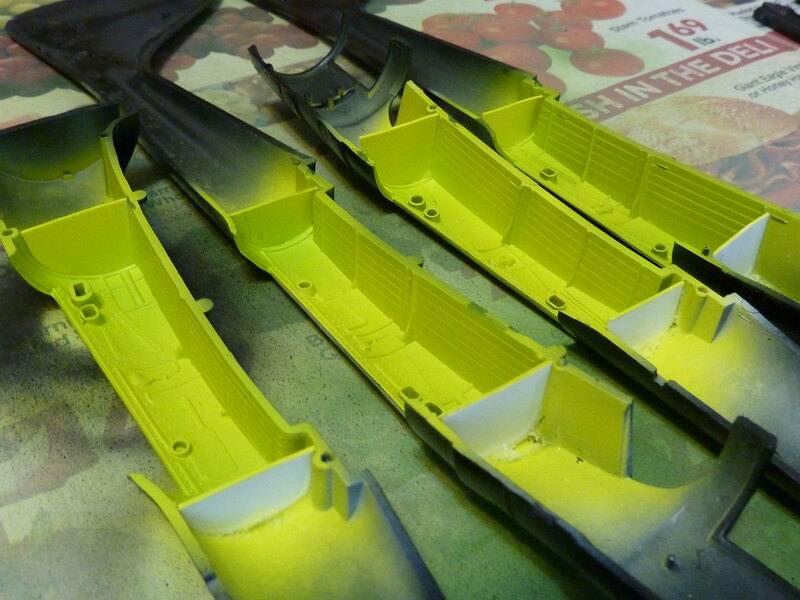 Fuselage is closed up, wings attached, and gaps and ridges puttied and sanded down. I wasn't too careful with the dihedral though. Despite that, the molds set the angle pretty nicely. Pretty surprising, given how poorly the rest of the kit has aged. I also started detailing the booms a bit. I made internal partitions, my first experiment scratchbuilding with sheet styrene. I'm also working on correcting the cowling rings...the left is closed, and the right is open. Not looking to do much more than open the left side, I do want this to be as OOB as possible.